SAN FRANCISCO--(BUSINESS WIRE)--Apple® today announced iPad Air™, the latest generation of its category defining device, featuring a stunning 9.7-inch Retina® display in a new thinner and lighter design. Precision-engineered to weigh just one pound, iPad Air is 20 percent thinner and 28 percent lighter than the fourth generation iPad®, and with a narrower bezel the borders of iPad Air are dramatically thinner-making content even more immersive. Apple today also announced iPad mini with Retina display, bringing all the pixels from the 9.7-inch iPad to its 7.9-inch screen, delivering razor sharp text and detail in the same amazingly thin and light design. 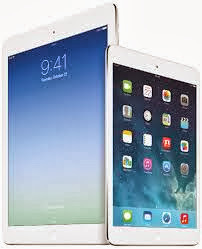 The new iPads feature the powerful and power-efficient Apple-designed A7 chip with 64-bit desktop-class architecture, ultrafast wireless with faster built-in Wi-Fi and expanded LTE cellular connectivity, and the newly-designed iOS 7 featuring hundreds of great new features. "iPad Air with its 9.7-inch Retina display weighs just one pound and packs the incredible performance of iOS 7 running on a 64-bit desktop-class Apple A7 chip, and delivers all-day battery life in the lightest full-sized tablet in the world." "iPad created an entirely new mobile computing experience, and the new iPad Air is another big leap ahead. It is so thin, light and powerful, once you hold one in your hand you will understand what a tremendous advancement this is," said Philip Schiller, Apple's senior vice president of Worldwide Marketing. "iPad Air with its 9.7-inch Retina display weighs just one pound and packs the incredible performance of iOS 7 running on a 64-bit desktop-class Apple A7 chip, and delivers all-day battery life in the lightest full-sized tablet in the world." Precision-engineered to weigh just one pound, iPad Air is 20 percent thinner and 28 percent lighter than the fourth generation iPad, and with a 43 percent narrower bezel the borders of iPad Air are dramatically thinner. iPad Air's Retina display makes web pages, text, images and video look incredibly sharp and realistic, and the new power-efficient A7 chip allows the battery to be even smaller, helping reduce the overall volume by 24 percent from the previous generation while doubling its performance and maintaining its up to 10-hour battery life. The new iPad mini with Retina display packs all the 3.1 million pixels (2048-by-1536 resolution) of iPad Air into its 7.9-inch Multi-Touch™ display, for a pixel density of 326 pixels per inch. The 7.9-inch Retina display of iPad mini is 35 percent larger than screens on 7-inch tablets, and is the only small tablet to deliver the full iPad experience, now with razor sharp Retina quality. Images are crisp, text is crystal clear, movies play at full 1080p HD-resolution and the 475,000 apps designed specifically for iPad work automatically. The A7 chip in iPad Air and iPad mini with Retina display offers 64-bit desktop-class architecture, advanced graphics and improved image signal processing from previous generations. With up to twice the CPU and graphics performance on iPad Air, and up to four times the CPU and eight times the graphics performance on iPad mini with Retina display, almost everything you do is faster and better than ever, from launching apps and editing photos to playing graphic-intensive games-all while delivering all-day battery life. The A7 chip's 64-bit architecture and support for OpenGL ES version 3.0 unlocks game console-like visual effects. The new iPads also feature the M7 motion coprocessor that gathers data from the accelerometer, gyroscope and compass to offload work from the A7 for improved power efficiency. Both new iPads feature two antennas to support Multiple-In-Multiple-Out (MIMO) technology, bringing twice the Wi-Fi performance to iPad Air and iPad mini with Retina display at a blazingly fast data rate up to 300 Mbps.2 Cellular models also come with expanded LTE coverage to accommodate even more LTE networks worldwide, while continuing to deliver comprehensive support for other fast cellular technology around the world (DC-HSDPA, HSPA+), all in a single model. iPad Air and iPad mini with Retina display now have a next generation FaceTime® HD camera with improved backside illumination sensors featuring larger pixels for better low-light performance. The iSight® camera with 5MP sensor and advanced optics, combined with iOS 7 and the image signal processing of A7, further improves still image and video capture on iPad bringing faster auto-focus, up to three times video zoom, five times still zoom, better dynamic range and automatic image and video stabilization. The new iPads come with iOS 7, featuring a stunning new user interface, completely redesigned with an elegant color palette, distinct, functional layers and subtle motion that make it feel more alive. iOS 7 has hundreds of great new features, including Control Center, Notification Center, improved Multitasking, AirDrop®, enhanced Photos, Safari®, Siri® and introduces iTunes Radio℠, a free Internet radio service based on the music you listen to on iTunes®. iPad customers have access to the revolutionary App Store℠, which now offers more than one million apps to iPhone®, iPad and iPod touch® users in 155 countries around the world, and more than 475,000 apps are designed specifically for iPad. More than 60 billion apps have been downloaded from the App Store, which offers customers an incredible range of apps in 24 categories, including newspapers and magazines in Newsstand, games and entertainment, kids, education, business, news, sports, health and fitness and travel. The iLife® suite of creative apps, including iPhoto®, iMovie® and GarageBand®, and the iWork® suite of productivity apps, including Pages®, Numbers® and Keynote® are essential to the Apple experience and are now free with every new iOS device running iOS 7, and are also available as free updates for existing users, so more iPad users now have access to these great apps. All apps have been redesigned to match the look and feel of iOS 7, have been optimized to support 64-bit technology and include hundreds of new features.